It's been a while since my last post, but I've been busy. Not on the shirt though - just working a new job for two weeks, so I had to concentrate on that. Anyway, I attached the front and the back of the shirt. I'm always amazed at how the shoulder yoke works on shirts. Basically it's a tube that contains all of the seam allowances. Because it's a tube it's a little stronger than a single layer of fabric (though I've seen shirts - and in fact have made shirts - where the yoke is cut on the bias, which allows it to move in different ways). 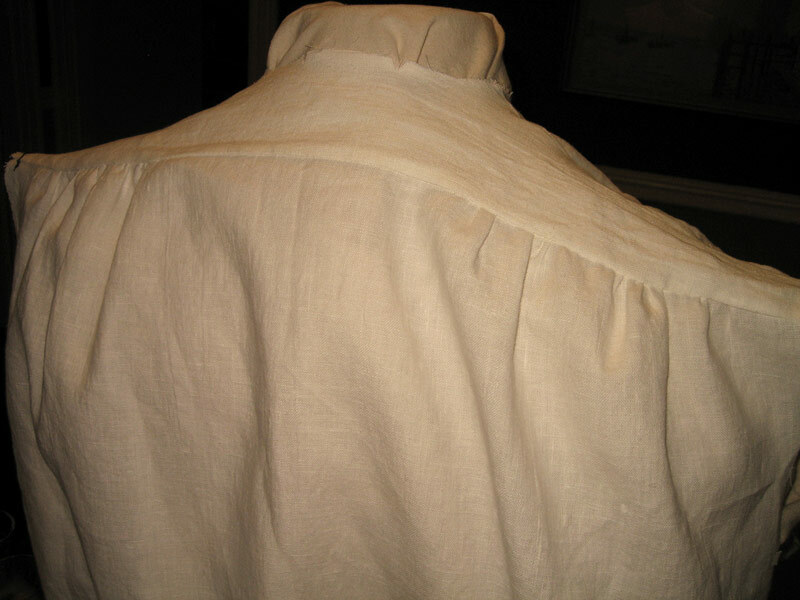 The images to the right and just below show the front and the back (the back is gathered to fit into the yoke; on most modern shirts there are either two side pleats or one centre pleat to accomplish the same thing). The next step was to start work on the sleeves. The first task was to make plackets for the cuff openings. 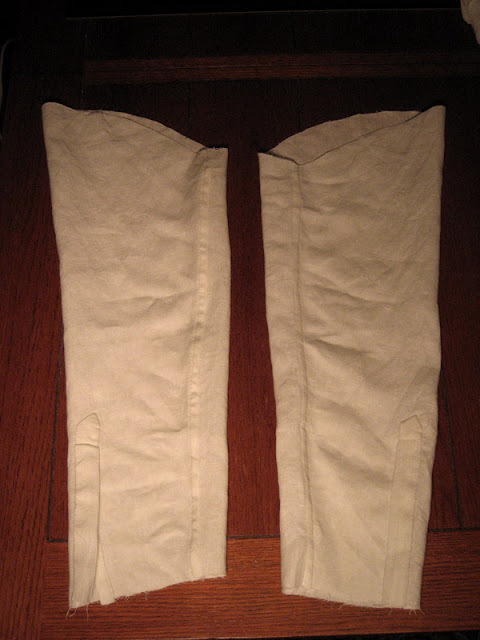 Again, these are seemingly complicated, but really just reinforce and contain the hems. I remember the first time I made sleeve plackets I thought they were arcane and very strange. Now I understand how they work, and they really aren't that difficult to make, although hand sewing made them a little bit wonky on this shirt. I don't know if it's because I didn't pin it well enough, or if just handling the shirt pulled the placket off from where I wanted it to be. In any case, no one will ever see them, as I'll be wearing a jacket over the shirt at all times. No one would see me in my shirtsleeves! 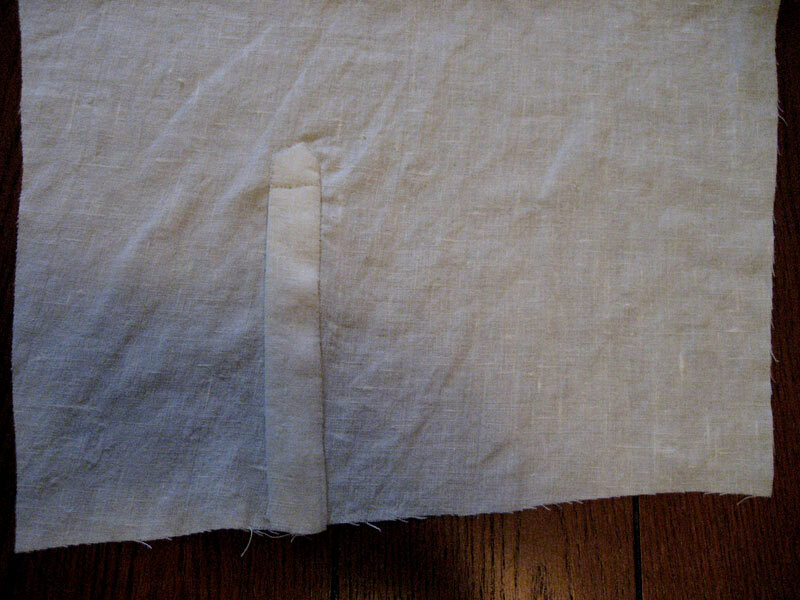 Below you can see the black chalk marks for the folds and cuts of the placket. I've already made some of the folds already, so the right-hand portion of the placket isn't showing the chalk lines. Here I've stitched around the border of the Y-shaped line, and then cut along that line. 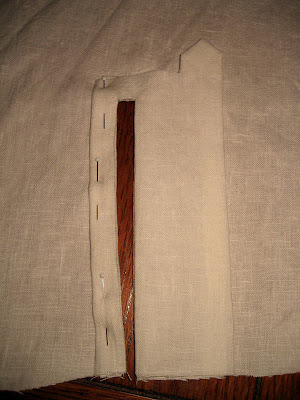 I turned the placket inside out. 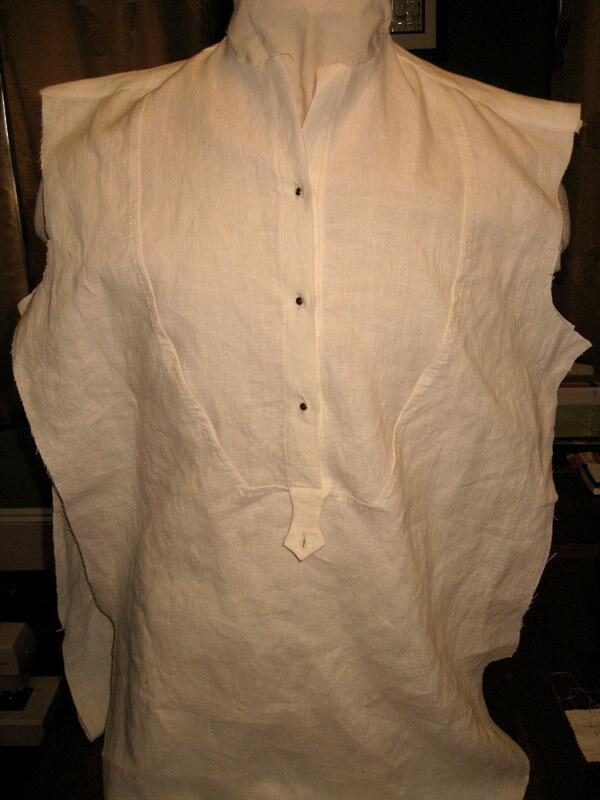 In this picture I ironed it flat and then realised that I shouldn't have done that, and ironed the folds out again. I really don't want any gap to show, not like that huge gap below. 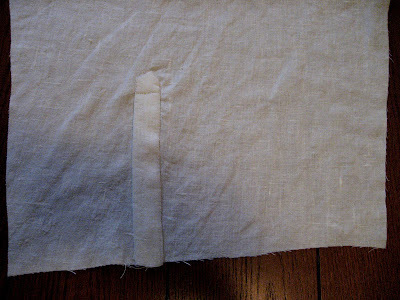 The edges of the cut should be right next to each other, just with the placket wrapping around them. Does that make sense? It really does make sense if you follow the directions right. 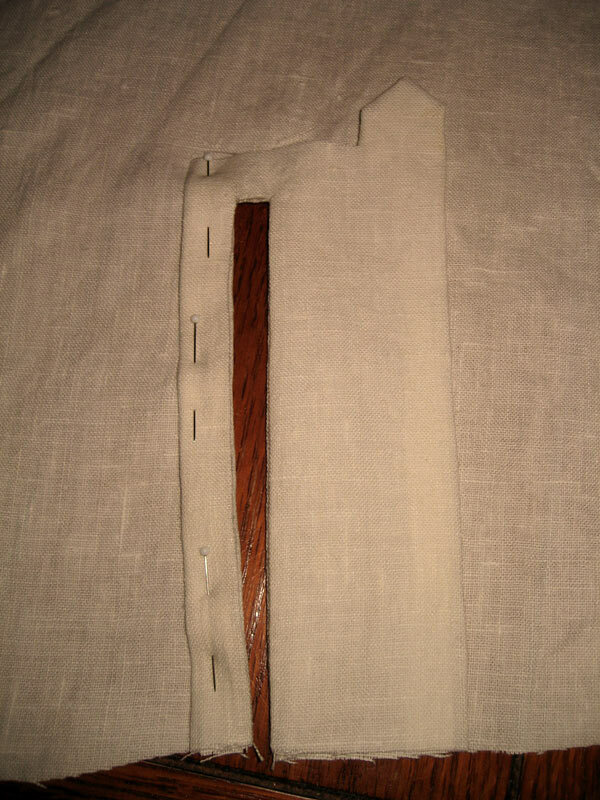 Here is the finished placket. Just a little wonky. If I'd machine stitched it, I would have used a topstitch all the way around, but since I was hand sewing I used a fell stitch for the entire thing, except for a back stitch across the top of the placket point to hold it all together. Finally, the (almost) finished sleeves. I still need to put the cuff bands on them. This shirt will have separate cuffs, just as it will have a separate collar. That way you could wear the same shirt a few times and always have clean cuffs and collar, which are the only parts anyone would really see anyway. 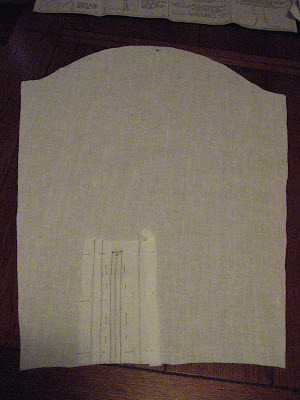 The sleeve seams are flat felled.